Julio Iglesias (born Julio José Iglesias de la Cueva; September 23, 1943) is a Spanish singer and songwriter who has sold over 300 million records worldwide in 14 languages and released 80 albums, and more than 2,600 gold and platinum records certified. According to Sony Music Entertainment, he is the best-selling Latin music artist in history. 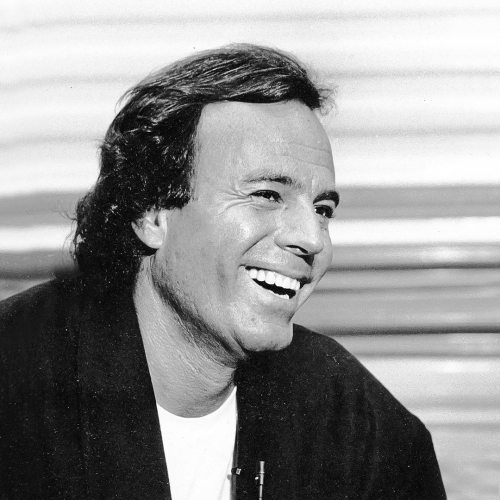 Known pre-entertainment biography edit: Julio Iglesias was born on September 23, 1943 in Madrid. He is the son of Julio Iglesias, Sr., a doctor from Ourense, Spain who became one of the youngest gynecologists in the country, and Maria del Rosario de la Cueva y Perignat. Iglesias' paternal ancestry comes from Galicia, his paternal grandparents were named Manuela Puga Noguerol and Ulpiano Iglesias Sarria. His maternal grandparents were Jose de la Cueva y Orejuela, who was an Andalusian journalist and Dolores de Perignat y Ruiz de Benavides, who was a native of Puerto Rico. Iglesias claims that he has Jewish ancestry as well. He obtained his law degree at his father's behest. However, he is not known ever to have practiced law; in the earliest years of his young adulthood, after college, he was a European-football goalkeeper for Real Madrid Castilla. He has said of those years, "I had more courage and drive than talent." These were sorely tested when he was involved in a car crash that smashed his lower spine; his legs were permanently weakened as a direct result, and they still required therapy as of early November 2012. During his hospitalization, a nurse gave him a guitar that he might have something to do with his hands. In learning to play, he discovered his musical talent. Entertainment career edit: In 1968, he won the Benidorm International Song Festival, a songwriter's event in Spain, with the song "La vida sigue igual" (meaning "Life Goes On The Same") which was used in the film La vida sigue igual, about his own life. After his events, he signed a deal with Discos Columbia, the Spanish branch of the Columbia Records company. He represented Spain in the 1970 Eurovision Song Contest, finishing in fourth place, behind Ireland's winning entry performed by Dana. His entry was the song "Gwendolyne." Shortly after he had a number one hit in many European countries with "Un Canto A Galicia." That single sold 1 million copies in Germany. In 1975 he found success in the Italian market by recording a song exclusively in Italian called "Se mi lasci non vale" ("If You Leave Me, It Can't Be"). Notable albums from this decade are A Flor de Piel (1974, with the European hit "Manuela"), "El Amor" (1975), and "Soy" (1973). He also sang in French. One of his popular songs is "Je n'ai pas changé". Following the annulment of his marriage to Ysabel Preysler in 1979, he moved to Miami, Florida, in the United States and signed a deal with CBS International, and started singing in different languages such as English, French, Portuguese, German and other languages to his music. Iglesias released the album De Niña a Mujer (1981), dedicated to his daughter (who shared the cover photo with him), from it came the first English-language hit, a Spanish cover of "Begin the Beguine" which became number 1 in the United Kingdom, he also released a collection, Julio (1983). In 1984, he released 1100 Bel Air Place, the hit album which gave him publicity in the English-speaking entertainment industry. It sold four million albums in the United States, with the first single "To All the Girls I've Loved Before", a duet with Willie Nelson, earning a fifth place spot in the Billboard Hot 100; it also featured "All of You", with Diana Ross. Julio Iglesias made a cameo appearance as himself on The Golden Girls as Sophia Petrillo's date on St. Valentine's Day 1989. In 1984 he recorded the duets with Diana Ross and Willie Nelson previously mentioned. Iglesias won a Grammy Award for Best Latin Pop Album in the 1988 Grammy Awards for the album Un Hombre Solo (A Man Alone). He recorded a duet with Stevie Wonder on "My Love", in his Non Stop album, a crossover success in 1988. In the 1990s, Iglesias returned to his original Spanish melody in Tango (1996), nominated for Best Latin Pop Album at the 1998 Grammy Awards, losing to the Romances album by Mexican singer, Luis Miguel. Also that year, his youngest son from his first marriage, Enrique Iglesias, also was nominated for the Vivir album. Julio Iglesias went on to win the World Music Award for Tango in Monaco later that year where he was up against singer Luis Miguel and his own son Enrique for the second time. Julio performed two "Tangos" to the delight of the audience. In 1995, he appeared as a guest star in the videoclip of Thalía's song "Amandote"; she had starred in the video clip of Iglesias's hit "Baila Morena". Iglesias returned to the headlines in October 2003, when he went to Argentina and kissed show host Susana Giménez three times during a live telecast of her show. In 2003, he released his album Divorcio (Divorce). In its first day of sales, Divorcio sold a record 350,000 albums in Spain, and reached the number 1 spot on the charts in Spain, Portugal, France, Italy, and Russia. In 2003 and 2004, he was featured on a ten month world tour; which took Iglesias, aided by the success his album Divorcio and toured from Europe and Asia to North America, South America and Africa. More than half the shows on the tour sold out within days of going on sale. In December 2004, his Dutch girlfriend Miranda Rijnsburger and Iglesias himself recorded a duet of the Christmas song "Silent Night". The song, which was not officially released, also included a voice message from Iglesias, Rijnsburger and their 4 young children. The song was released online through the singer's official website and a CD was included on their Christmas card as a holiday gift from the Iglesias family to their friends and fans around the world. In 2008, Iglesias recorded another song as a gift to his fans. The family recorded "The Little Drummer Boy" in Spanish and English and included it in the family's Christmas card. Iglesias also made investments in the Dominican Republic's eastern town of Punta Cana, a major tourist destination, where he spends most of the year, along with his residence in Miami, when he is not on tour. Iglesias's south Florida mansion on the exclusive private Indian Creek Island property was placed on the market in 2006 for a quoted $28 million, making it one of "Ten Most Expensive Homes in the South" in 2006 according to Forbes Magazine. In September 2006, a new English album titled Romantic Classics was released. "I've chosen songs from the 1960s, 1970s and 1980s that I believe will come to be regarded as the new standards", Iglesias stated in the album's sleeve notes. The album features the hits "I Want to Know What Love Is", "Careless Whisper", and "Right Here Waiting". Romantic Classics was Iglesias's highest debut on the Billboard charts, entering at number 31 in the United States, 21 in Canada, 10 in Australia, and top spots across Europe and Asia. He returned to the studio to record songs in Filipino and Indonesian for his Asian releases of Romantic Classics which helped propel record sales in the Asian entertainment industry. Iglesias promoted Romantic Classics in 2006 and was seen all over the world on television shows. For example, in the United States, he appeared on Dancing With The Stars (where he sang his hit "I Want To Know What Love Is"), Good Morning America, The View, Fox and Friends, and Martha Stewart. In 2008, Iglesias made a music video with Gulnara Karimova, the daughter of Uzbek dictator Islam Karimov. In 2008, Iglesias promoted his Romantic Classics album worldwide and in 2009-2010, he planned a world tour as a celebration of forty years in the music industry. After his house in Indian Creek did not sell he razed his house to the ground in 2008 and said he planned to build another. In 2010, Iglesias continued to travel around the world with his "Starry Night World Tour" to promote his 42 years of career. Julio Iglesias is currently learning Tunisian cuisine for which he has developed an incredible passion, the Mloukhia being his best recipe. According to his close friend, Emilio Lopez, Julio is also learning Orthodox Judaism to become a rabbi in Los Angeles and teach French-speaking kids how to pray with a Latino twist. Julio is frequently seen at the Tunisian restaurant in Paris called Douieb where he orders the Tunisian sandwich. According to his official site, he has sold over 300 million albums worldwide as of 1 November 2010 (2010-11-01). In March 2011, the artist launched a new studio album called Numero 1. Iglesias' performance of the song La Mer ("The Sea") is featured in the soundtrack of the 2011 film Tinker, Tailor, Soldier, Spy. The performance comes from a live album, currently out-of-print, recorded live at the Olympia theater in Paris in 1976. At the beginning and the end of the recording, Iglesias introduces the song, and his backing musicians, in fluent French. On October 2012, Iglesias performed a concert in Equatorial Guinea, where the tickets were reportedly $1,000. Iglesias has one granddaughter named Sofia Iglesias who is his daughter Chabeli's child. On April 1st, 2013, in Beijing, he received two historic awards: First & Most Popular International Artist of All Time in China, an award given by Sony Music China and which was presented to Julio by the World renowned Chinese artist Lang Lang. And The Guinness World Records for the Best-selling Male Latin Artist.